On 9 May 1924, Cuban bartenders met in the billiard room at Hotel Ambos Mundo to draft a series of regulations written by Manuel Blanco Cuétara and drafted by attorney Manuel Zavala. After a couple of interim meetings, the final draft of the organisation’s charter was approved by the government on 27 June 1924, registering El Club de Cantineros de la Republica de Cuba in the Special Register of Associations with Ambos Mundo’s José Cuervo Fernandez as president and Cristóbal Blanco Alvarez as secretary-general. Within its first six months, the Club sported 121 members. Bartender-teachers Don Jose Maria Vazquez Prieto, Manuel Taboada and auxiliary Fabio Delgado were not the only instructors who drilled new students on the proper making of cocktails. Humberto Martin, Artemio Prieto , José Perales and the co-author of this official Manual del Cantinero León Pujol also contributed their knowledge and expertise. 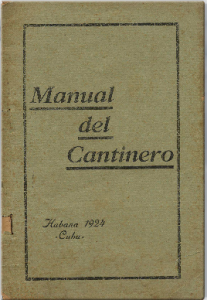 Subsequent cantinero manuals grew in size and depth of knowledge, published in the 1930 Club de Cantinero de la Republica de Cuba: Manual Oficial and 1948 El Arte del Cantinero. The recipes in this first manual—Manual del Cantinero—are simple and to the point, making them easy to memorise, which each certified cantinero did.